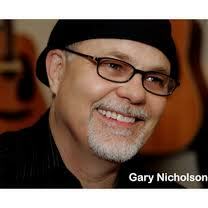 Gary Nicholson is a number one hit songwriter, a two time Grammy winning producer, a world traveling performer, recording artist, and session guitarist. In 2006 he was nominated to the Nashville Songwriter’s Hall of Fame, in 2011 he was inducted into the Texas Songwriter’s Hall of Fame. There are over five hundred recordings of his songs in various genres including country, rock, blues, folk, bluegrass, and pop by such diverse artists as BB King, Garth Brooks, George Strait, Fleetwood Mac, Bonnie Raitt, Willie Nelson, Etta James, John Prine, Dixie Chicks, Stevie Nicks, Buddy Guy, Emmylou Harris, Keb Mo, George Jones, Neville Brothers, Reba McKentire, Robert Plant, Waylon Jennings, Patty Loveless, Kenny Chesney, Guy Clark and the list goes on. In addition to his Grammy winning records with Delbert McClinton, who has recorded over forty of his songs, he has produced records for The Judds, Wynonna, Pam Tillis, Billy Joe Shaver, T Graham Brown, Chris Knight, Taylor Hicks, Seth Walker and others. His work has been included in many major motion pictures and television, the song “Falling and Flying “ is featured in the Oscar winning film “Crazy Heart” performed by Jeff Bridges. ”Peace Dream” recorded by Ringo Starr was co-written by Gary, Ringo, and Gary Wright and features Paul McCartney on bass. Current songwriting credits include a song on the new release by Bonnie Raitt, another co-written song with Ringo Starr for his new cd, and new recordings by George Strait, Dierks Bentley, The Mavericks, and a BB King/Buddy Guy duet.